I wrote this poem after reading the following in the September 1995 edition of Jazz Times. Used by permission. next to the bench I was sleeping on. I could get some rest. the handle on the case. there were still some notes left in it. that it’s a long time since I’ve been in a bank. bought a Danish and a cup of coffee. which I thought was sort of funny and I think she caught it. into my horn case and I remembered where I was. some guy walked up to me and said I sounded like Hank Mobley. went down to Tony’s for a cheesesteak. *This poem is dedicated to the memory of the great tenor sax man Hank Mobley. 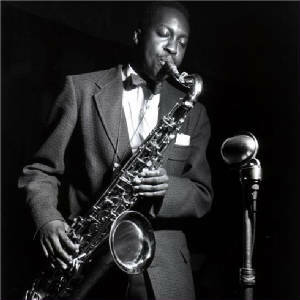 Hank Mobley. Source of picture unknown. Hank Mobley, a jazz saxophonist of international stature who played with the leading musicians of the day and made his greatest impact as a member of the Miles Davis group in the 1960s, died Friday. He was 55 and had lived in Philadephia since 1972. Born Henry Mobley in Eastman, Ga., he moved to the Newark-Elizabeth, N.J., area in childhood and studied music privately. Early in his career he played with the Paul Gayton orchestra and other regional bands. As a tenor saxophonist, his most important associations in jazz were with the Horace Silver and Art Blakey groups in the 1950s and the Davis aggregation the following decade. Later he was the co-leader of combos with Lee Morgan, Kenny Dorham and Cedar Walton. In 1967-68, he toured Europe, making appearances in London, Paris, Munich, Rome and other cities in Poland, Hungary and Yugoslavia. Among the many musicians in his ken over the years were Dizzy Gillespie, Max Roach, Slide Hampton, Wilbur Ware and Philly Joe Jones. He played recently at the Angry Square on New York’s 7th Avenue. Survivors include his father, Otis Rogers; his stepmother, Lillian O. Rogers; and two aunts, Jenethel Cooney and Rosa Boyer. Friends may call from 6 to 8 p.m. Friday at the Johnson Funeral Home, 46th Street and Woodland Avenue. Burial will be Saturday at Mount Lawn Cemetery, 84th Street and Hook Road, Sharon Hill, Delaware County. –Philadelphia Daily News, June 4, 1986. Used by permission.